AHN Universal Tip Racks are manufactured in Germany by AHN Biotechnology as a very high quality product meeting the most stringent manufacturing standards for the most discriminating users and at affordable prices. AHN Universal Tip Racks are fully compatible with multichannel (9 mm spacing) and single channel pipettors from all manufacturers. The uniquely designed AHN universal racks have 96 hole alignments that coincide precisely with 96 well microtitration plates. Excellent structural stability means that tips are seated securely and uniformly. 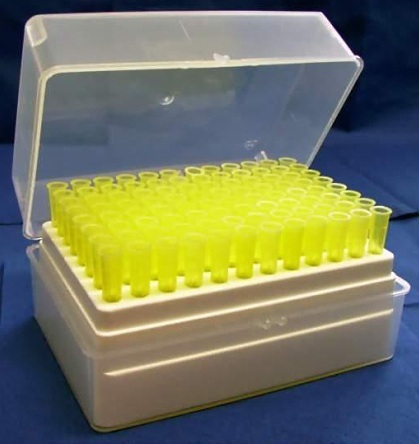 Each rack is placed in a hinged rack box with hinged lid and pipettor access for one hand use, perfect for use with multi-channel pipettors in the 8 × 12 or 6 × 10 format. It is easy to fill and refill the rack box with AHN tips or other brands of universal tips. Rack boxes and other plastic products from AHN Biotechnology are injection molded from autoclavable, non-wettable, premium grade, virgin, low adhesion polypropylene on state of the art equipment in accordance with ISO 9001 and DIN standards.. The use of lubricants that may be harmful to samples is eliminated from the manufacturing process. All dyes used to color the range of AHN products are guaranteed to be completely metal free, eliminating any risk of sample contamination by trace elements. AHN Rack Boxes are fully autoclavable (121°C, 0,1 Mpa, 20 min.). Available in cartons of 10. Inquire about VP Volume Pricing. Rose offers the entire range of premium tips manufactured in Germany by AHN Biotechnolgy, as well as other outstanding tips from Swiss manufacturer Socorex and Rose Scientific’s own Rose brand.